Sakai KENKIKUSUI Japanese Pro Knife,Hi-Carbon Steel,Yo-Deba(Western Deba Knife) (210mm/8.3'') by KENKIKUSUI at Sara Stage. Hurry! Limited time offer. Offer valid only while supplies last. Sakai KENKIKUSUI Japanese Pro Kitchen Knife, Yo-Deba(Western Deba Knife),Made in Japan, from workshop in Sakai/Osaka prefecture,established in 1930s. Sakai KENKIKUSUI Japanese Pro Kitchen Knife, Yo-Deba(Western Deba Knife),Made in Japan, from workshop in Sakai/Osaka prefecture,established in 1930s. 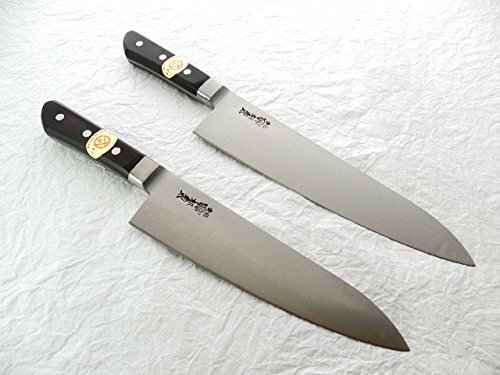 Yo-Deba(Western Deba) are double bevel and used not only for fish but meat as well.To differentiate them from Japanese traditional Deba, they are called Yo-Deba in Japan. It looks like Gyuto in shape, but the blade is much thicker and extremely sturdy. For basic professional use, blade material is based on Cost effective Hi-Carbon Japan Steel.Easy maintenance by sharpner or whetstone. If you have any questions about this product by KENKIKUSUI, contact us by completing and submitting the form below. If you are looking for a specif part number, please include it with your message.